Chester Arthur Briggs, Jr., President of the Barre Historical Society, passed away at his home in East Calais, Vermont, on January 2, 2014, surrounded by his beloved wife, his son, his nephew and his dog. He passed gracefully, in the manner of his choosing and cradled by love. The dignity of his departure matched the dignity of the life he led. An inspiration to countless people, Chet’s joy, compassion, humor and mischievous nature endeared him to everyone. His intellect, wisdom and humility were gifts he shared with every life he touched. He helped start the first student co-op residence in Austin, in which Janis Joplin was one of his housemates. He was co-owner of The Psychedelic Pizza Parlor, the first live music venue that hosted Roky Erickson & The 13th Floor Elevators. During his student days he met the love of his life, Karen Lane, whom he later married. Together they moved to Atlanta in 1970, to open the regional office of the Central Committee for Conscientious Objectors (a national draft counseling organization) in response to the needs of active military, veterans, draftees, and resistors who opposed the Vietnam War. Soon after, Chet and Karen moved to Vermont, purchasing a historic house in East Calais that was in need of renovation. Chet became Head Start director with Central Vermont Community Action Council, and later served as administrative director for the agency. He developed two award-winning projects for the Partners of the Americas: Vermont/Honduras—one for rural farmers and the other for small business owners. He also owned and operated his own firm, Public Management Systems, and was a statistician with Vermont Medicaid for 13 years. Every moment of Chet’s life was spent in pursuit of helping the world around him; his efforts were political, cultural and personal, yet always grew from the same fundamental need to give. From civil rights to anti-war activism, from organic farming to the Red Cross, from music festivals to Chinese cooking, Chet was tireless in his efforts to elevate his community and its conversations. From 1978-82, Chet helped chair the hugely successful Barre Ethnic Heritage Festival. 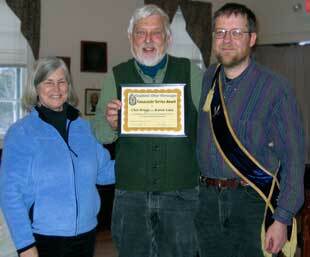 He also served on the board of the Champlain Valley Folk Festival for 17 years. He was a popular guest chef, including at the annual Chinese New Year’s Banquet and Auction to benefit the Aldrich Library of Barre. 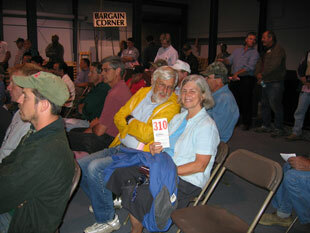 They have held similar fundraisers for the People’s Health & Wellness Clinic and for Central Vermont Red Cross. During his employment with the State of Vermont Agency of Human Services, Chet was an activist leader of the Vermont State Employees Association ( VSEA ). Chet served for many years on the VSEA Council and was also the chair of the contract bargaining team for the Nonmanagement Unit of VSEA, the unit representing the majority of state workers. Many young VSEA members moved into leadership roles as a result of Chet’s encouragement. Chet was a member of the Barre Rotary Club, and past-president of the Vermont Alliance for Retired Americans, advocating for the preservation of Social Security and Medicare benefits for seniors.As president of the Barre Historical Society, Chet has been instrumental in the restoration of Barre’s Socialist Labor Party Hall, a National Historic Landmark. Chet earned his master’s degree in public administration at the University of Vermont in 1994. He was a long-time volunteer of the American Red Cross, serving as disaster services director for the Central Vermont/New Hampshire Valley Chapter and providing aid through multiple disasters, most recently Irene & Sandy. Chet was vice president of the board of Central Vermont Home Health and Hospice, where he served on the long-range planning committee. Few people gave as much support and love to those around him as Chet did; few people laughed, listened and enjoyed life so much as he. Any interest or passion he came upon was explored to the point of expertise. He was truly progressive: politically and culturally ahead of his time, Chet’s experience also spanned the gap between the depth of history and tradition and the vigor of the future and human advancement. He strived to teach those around him as much about ancient folk music as he did about the next developments in computer engineering. Atop all the social and political conflicts Chet fought throughout his life, his last few years were also been a long battle for health. Chet was a powerful, resilient man and it took many ailments acting in concert to bring him down. Still he found humor in his struggles until the last. The world has been immeasurably improved for his having been in it; the world is the worse for having lost him. There was be a celebration of his life, with music, Chinese food & friends at the Socialist Labor Party Hall on January 25, 2014. Please send tributes, photos and music honoring Chet to chetbriggsremembrance@gmail.com. Chet’s Fund has been established by the Barre Historical Society to assist the Hall in recovering from future crises. Donations to Chet’s Fund may be made by credit card right here or by check to the “Barre Historical Society” (PO Box 496, Barre, VT 05641). 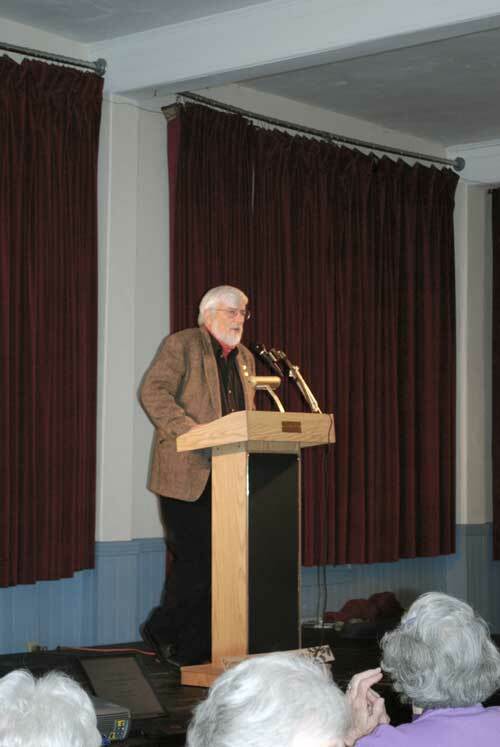 Classic image of Chet at the podium at an Old Labor Hall event. 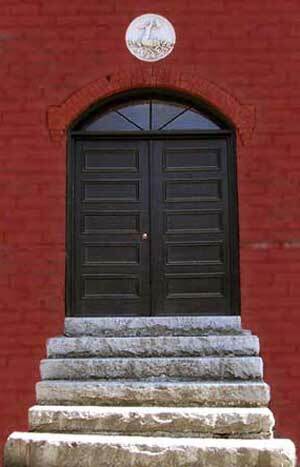 Chet’s constant care was for the fabric of the Old Labor Hall. 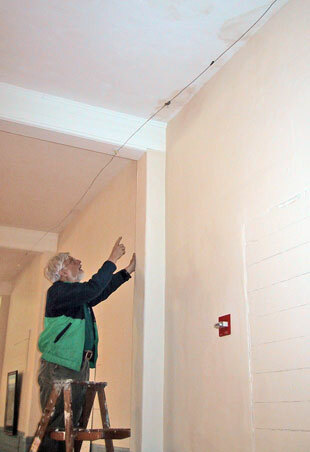 Here he points out the results of the leaking roof. 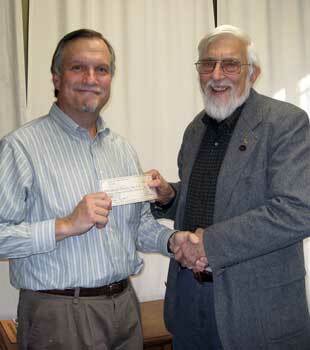 Chet making the final Old Labor Hall mortgage payment to Paul Hill of the Vermont Community Loan Fund. 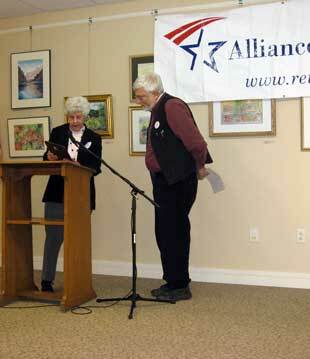 Chet receiving an award from the Vermont Alliance for Retired Americans.